This new yacht model is making its world debut at the 2012 Tullett Prebon London Boat Show in January 2012. Sunseeker Yachts unveils the new Sunseeker 28 model. She is the first of a distinctive new generation. It combines the latest in innovation and technology. The new 28 is the perfect platform for term charters of 4 to 8 guests. The 2012 Sunseeker 28 shows a new “look” for the famous performance yacht builder. Most captivating is the remarkable extent of main deck glazing. Full height and pillarless, the glazing flows continuously down the sides and around the rear of the saloon, where it merges with the aft patio doors. This new wrap-around glazing gives the main deck accommodation a unique, panoramic floor-to-ceiling view and a bright, sun-filled interior. External conversation areas on the foredeck and flybridge have been innovated with new sunpad and group seating formats. The expansive foredeck has given rise to a completely new seating/sunpad layout with a center companionway emphasizing the increased social areas. The large flybridge deck offers unrivaled room for any mega yacht charter vessels in the 25 to 30 meter range. This space can be tailored to suit every owner’s needs – from spa tubs to extended sunpads, this area will have multiple entertainment layouts. Offering a breakthrough in interior layout and design, the Sunseeker 28 features interior furnishings selected from the 2012 Sunseeker Collection of materials and linings, ensuring that the striking exterior design continues throughout the interior. Two individual stairways lead down to four well appointed (and spacious) staterooms, including two VIP double staterooms and a full-beam master suite. Each cabin incorporates the large viewing window now synonymous with Sunseeker design. With excellent performance speeds, modern exterior lines, and refined interiors, the new Sunseeker 28 is a remarkable new craft. 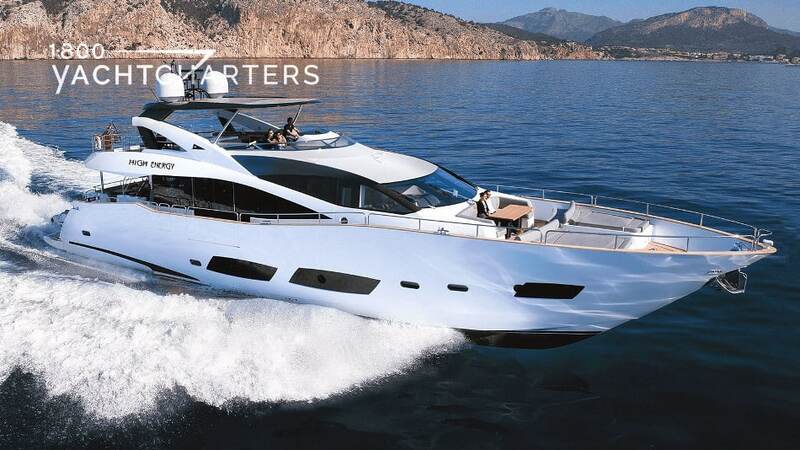 She will soon join similar-sized 2011 models already in charter such as Sunseeker Predator 84 yacht FIRECRACKER and Sunseeker 34 yacht TUPPENCE. STAR FISH AND BIG FISH? 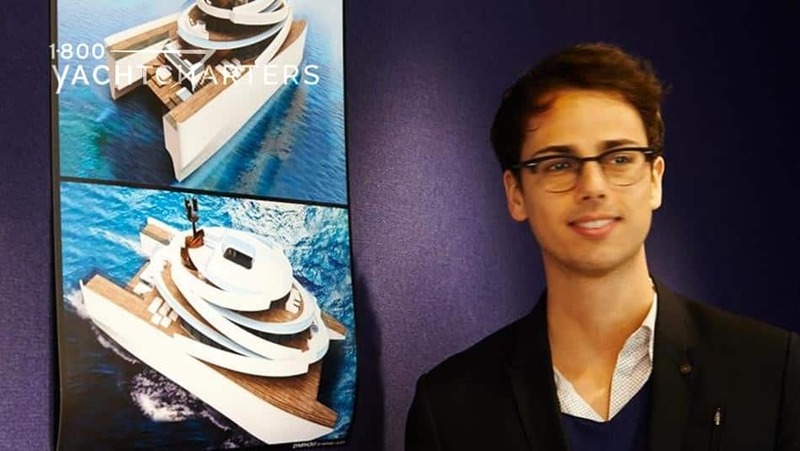 How do you top yourself if you’re the creator of a multi award-winning superyacht? It is easy. Build the same yacht again…only bigger and better. This yacht follows in the footsteps of the acclaimed 45 meter Aquos Yachts motor yacht BIG FISH. Fifty meter motor yacht STAR FISH is under construction at McMullen & Wing. 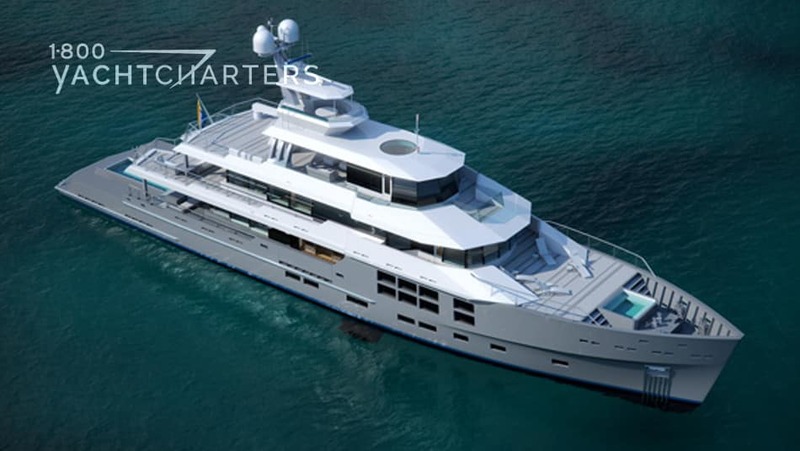 Aquos motor yacht STAR FISH projects to launch in April of 2012. She is based on the same hull form as M/Y BIG FISH. She will have six staterooms, for 12 guests. She accommodates 14 crew. Her Owner’s deck has optional forward-facing cabin and both fore and aft decks. STAR FISH has a unique arrangement by Greg C. Marshall Naval Architects. It allows the skylounge deck to be dedicated solely to owner’s use. It can also be incorporated in the yacht’s public space scheme during luxury yacht charter outings. The captain’s cabin and wheelhouse are located above. They are on a fourth deck with a dramatic flying bridge and observation pod above it. Fore! 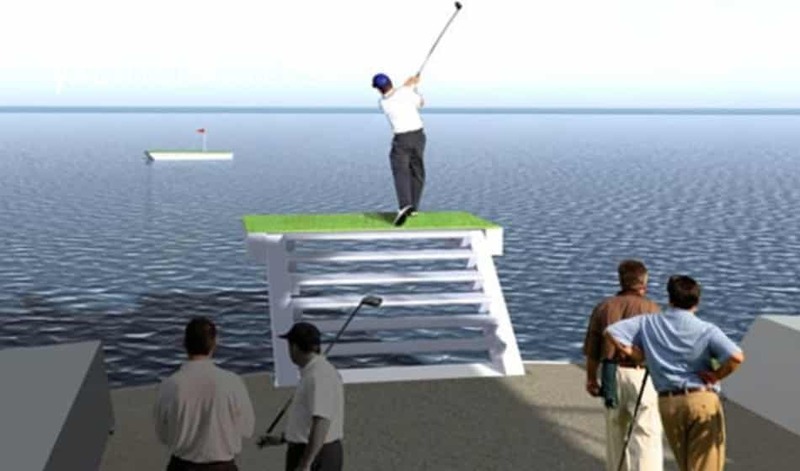 At the back of the yacht, builders create a golf green for golfing enthusiasts to practice their drives. Using biodegradable (fish food) golf balls helps the environment. We first introduced our readers to McMullen & Wing yacht BIG FISH in January 2011, as the vessel set out on an around-the-world odyssey. Along the way, the owner, designer, and builders continued to collect awards and platitudes for the edgy, angular, and dramatic megayacht, specifically created for sea-going adventure. While there are numerous awards for megayacht designers and builders of the largest luxury yacht charter vessels, the crews of these floating works were often overlooked – until now. A new competition has been organized by yacht management company, Krystal Yachts, and the search is on for the world’s best yacht crewmembers. Supercrew 2012 is designed to allow superyacht captains to recognize outstanding members in their employ. Presented quarterly, and based on the exclusive nominations of captains, the award goes to the individual that best demonstrates the qualities of ability, attitude and going the extra mile. Each quarter a panel of judges will determine the winner. The winner will receive an engraved iPad and be included on the guest lists of all future Krystal Yachts events. The competition is open to professional crew members who work on any luxury yacht. Nominations for Supercrew 2012 open in January, 2012. Come experience the service of a highly-trained, professional crew on your own yachting holiday. 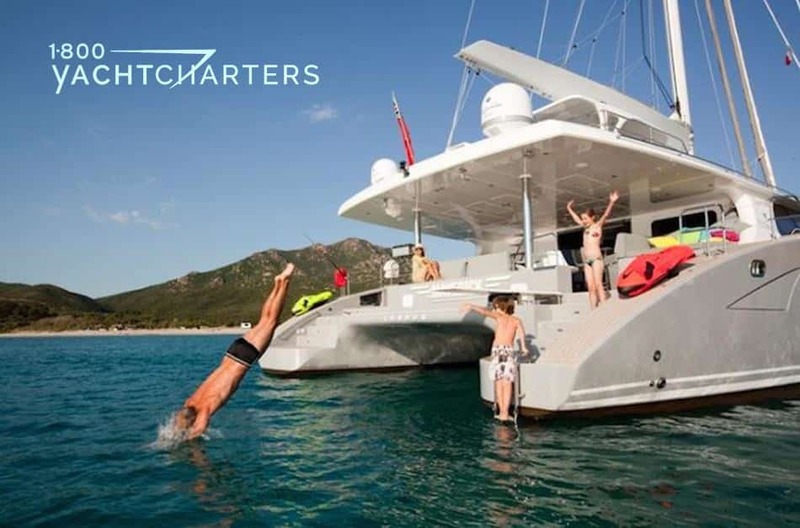 Contact the 1-800 Yacht Charters specialists at https://www.1800yachtcharters.com/book-now-contact-us/ for further vacation details. While the popularity of Bahama yacht charters has increased in recent years, the availability of reasonably-priced airfare to the island nation has stymied many a potential luxury yacht charter customer. Flights from South Florida to the Bahamas are often more expensive than coast to coast flights across the United States. Not only that, but some clients are reluctant to fly to their destination and want an alternative in a ferry boat. VOILA! Fortunately a new alternative to traveling to and from the Bahamas has been unveiled. On December 16th, Balèaria Bahamas Express introduced inaugural high speed ferry service between Port Everglades (Fort Lauderdale, Florida) and Freeport (Grand Bahama). The 74 meter ferry Pinar del Rio cruises at 32 knots and can make the 76 mile crossing in 2.5 hours. The service runs daily, except on Wednesday, with a convenient schedule that allows passengers from the USA to return on the same day after spending the day on Grand Bahama Island. Pricing starts at $49.50 per person, one way, with first class seating available for $90 per person each way, plus local taxes. Spanish-based Balèaria specializes in the transportation of people in the Mediterranean. With nearly 1000 employees and 15 ships in operation, the company ferried almost 3 million passengers in 2010. The company is also working on establishing service from South Florida to Bimini in 2012. 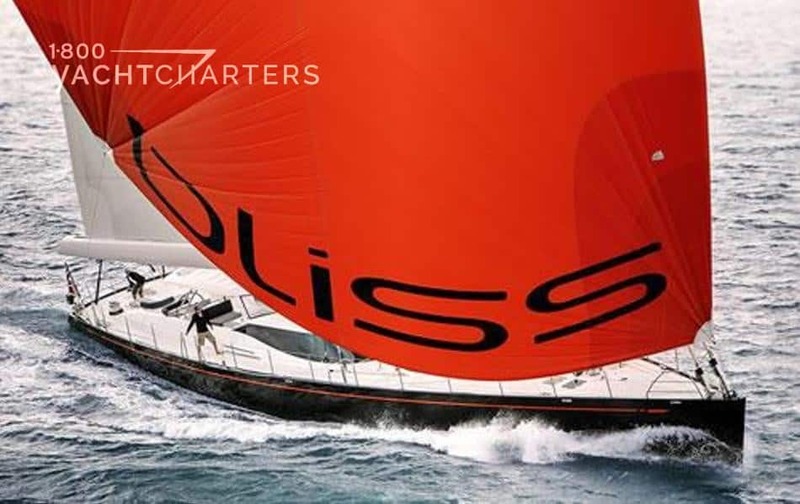 The owner of sail yacht BLISS has announced an ALL-INCLUSIVE special offer on the 37 meter luxury yacht charter vessel. 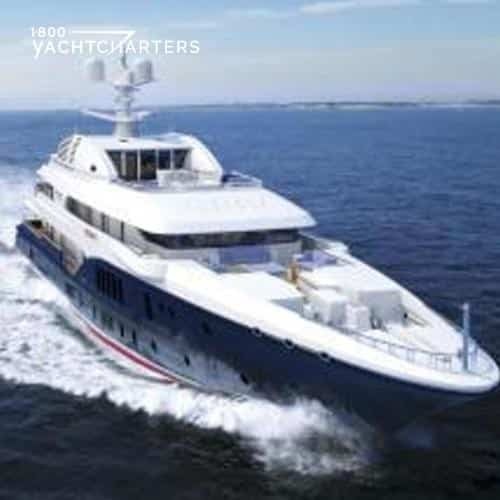 The charter rate of $98,000 per week includes three meals per day, standard bar and table wines, generator fuel, main engine fuel for an average of 3 hours per day, ship’s laundry, airport transit fees, and berthing fees for the first and last nights. Not included, and to be charged to the charterer, will be any requested vintage wines and champagnes, communications costs, marina fees (apart from first and last night), and any shore excursions. With her clean lines and contemporary design, sloop sailboat BLISS is a harmonious blend of comfort, style, and speed – ideal for extended cruising. 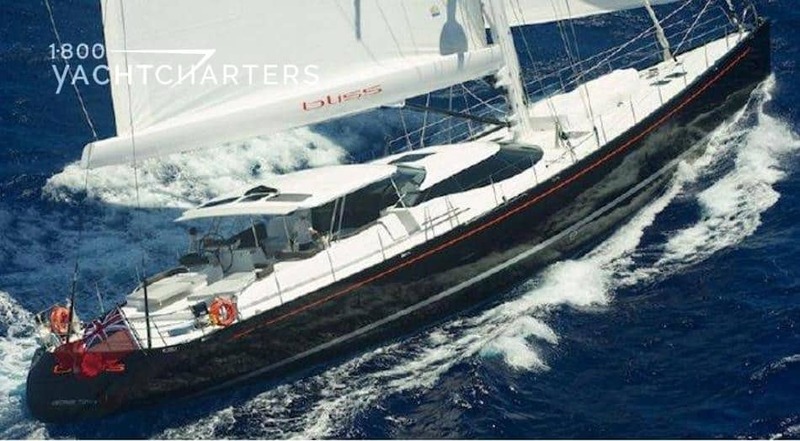 Her composite hull and performance rigging enable her to sail efficiently in most wind conditions, offering comfortable cruising at all times, plus more exhilarating performance when desired. Her modern interior décor features custom paint finishes with textured leather and shagreen-wrapped (stingray skin) panels. Outdoor areas offer sunbathing, shaded cockpit dining and a convenient swimming platform. BLISS offers flexible and luxurious accommodations in three ensuite cabins, two of which can be configured as doubles or twins. Four additional Pullman berths allow her to accommodate up to 10 guests in total, making her perfect for families or groups of friends. 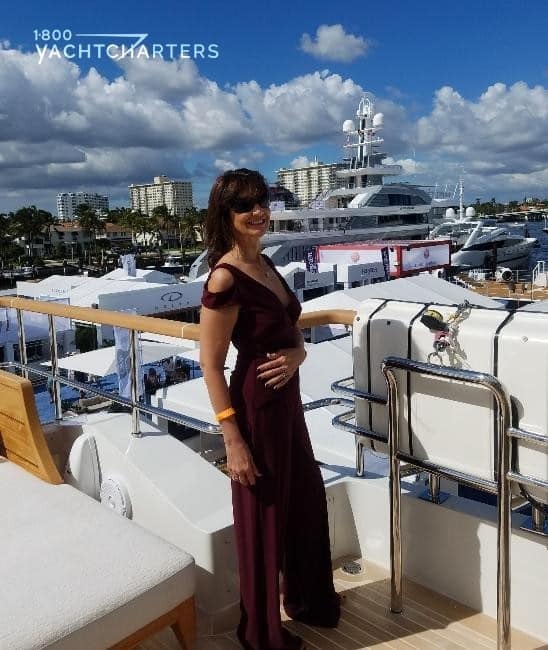 As the year draws to a close, luxury yacht charter maven Jana Sheeder, President of SailAway Yacht Charter Consultants and 1-800 Yacht Charters, is beaming. Sheeder’s companies have a reputation of offering the newest and largest yachts in the world’s best destinations. 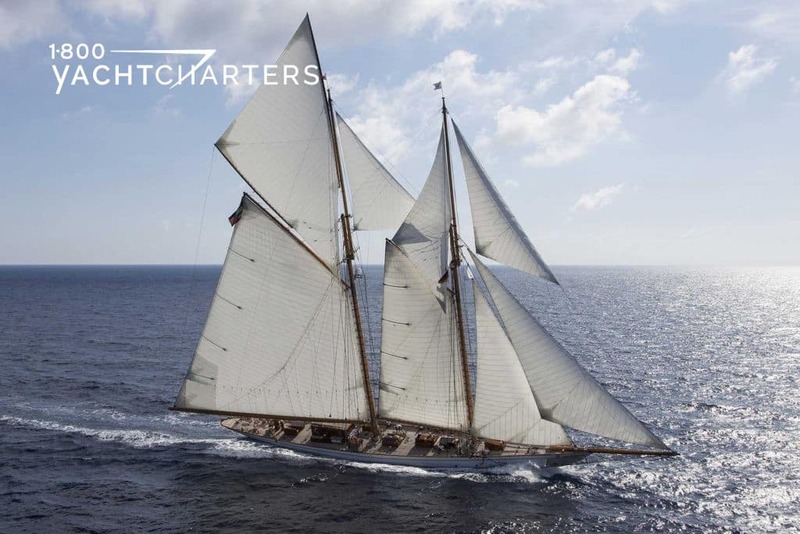 She and her teams spend countless hours identifying potential charter yachts. Important to realize, many of the new yachts are award winners in global design competitions. Competitions, for instance, the annual ShowBoats Design Awards. 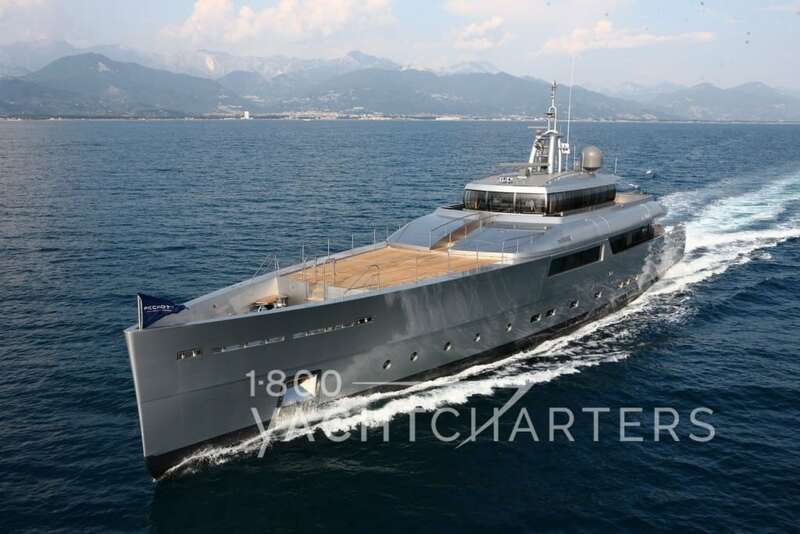 Recent award winners promoted by SailAway to their clients include late 2010 launch Perini Navi motor yacht EXUMA (Best Exterior Design & Styling Award: Displacement Motor Yachts 100-199). Also, the 42 meter Holland Jachtbouw motor yacht CALLIOPE (Best Exterior Design & Styling Award: Semi-displacement Motor Yachts). In conclusion, as to the new year, Sheeder is even more optimistic. Happy Holidays to the yacht charter community! At this wonderful time of the year, we at 1-800 Yacht Charters and the SailAway Family of companies would like to wish you a very happy holiday season. 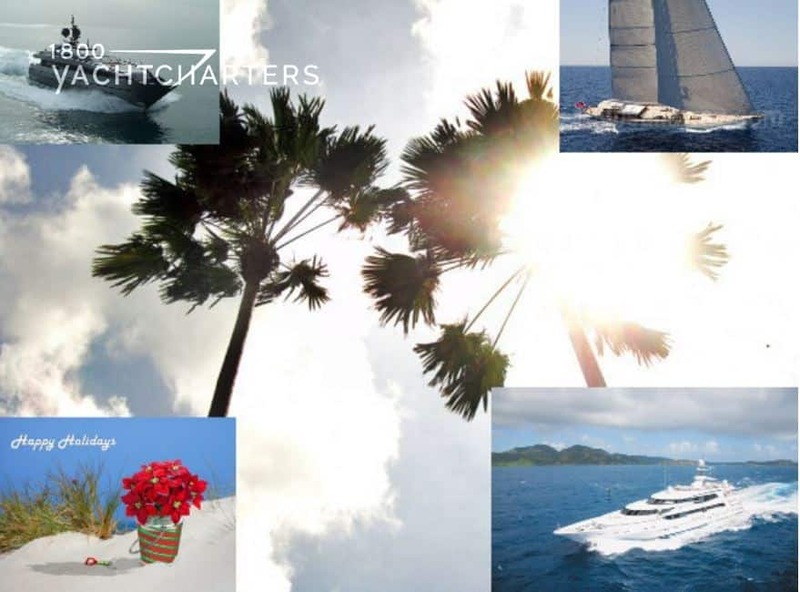 We are eternally grateful to you for your patronage, readership, comments, suggestions, and interest in what we offer, be it super yacht charters, renting a private yacht, bareboat charter, or yacht charters in locations such as Greece, the Virgin Islands, St. Barts, the French or Italian Riviera, Ibiza, the Bahamas, New England, or anywhere else in the world. at the luxurious Ciragan Palace Kempinski on 5 May, 2012. Combining a glittering awards ceremony with a gala dinner/dance, the Awards , often dubbed the “Oscars” of the superyacht industry, will be attended by an elite guest list of megayacht owners from around the globe. 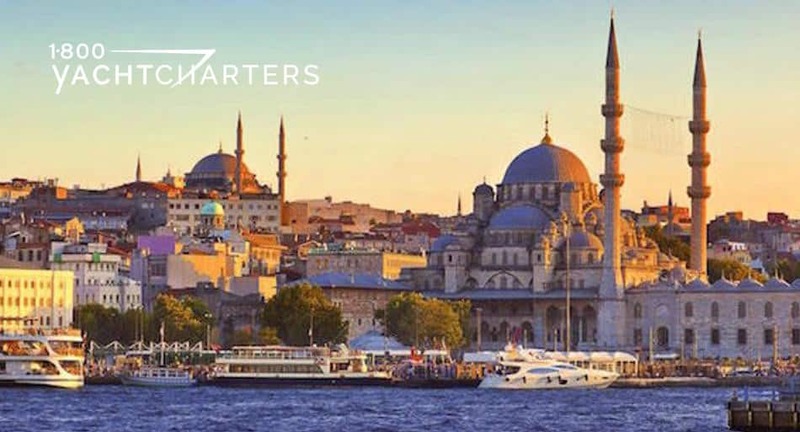 Straddling the Bosphorus Strait separating Europe and Asia, Istanbul embodies the best of both cultures. The city has been the capital of three empires, each leaving a heritage of amazing architecture and monuments. 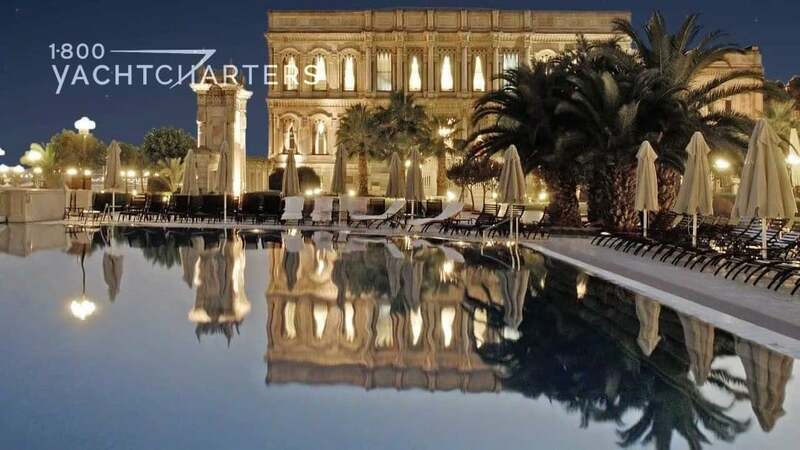 Once an Ottoman palace, the Çiragan Palace Kempinski Istanbul is located on the European shores of the Bosphorus with spectacular views over the strait. A 5-star resort, it is a registered member of The Leading Hotels of the World. Its 313 luxurious rooms include 20 suites in the hotel and 11 suites in the historical palace. How Do You Get To St Barts? Where is Caribbean yacht charter island, St. Barts? “Dear SailAway – I love reading the blogs about the big yachts and all of the celebrities that hang out in St Barts during the holidays. I will be in St Martin for a hotel-based vacation, and while I can’t afford a luxury yacht charter, I would love to see St Barts. What’s the best way to get there? There are daily flights from Princess Juliana International Airport (SXM) located in St Maarten (Netherlands, Antilles). It’s a short 10-12 minute flight to St Barth’s Gustave III Airport, located on the island’s north coast. The descent is a real nail biter for the fainthearted, necessitating a pass through a narrow break in a hilltop and a landing on the 280 meter runway that ends on St Jean beach. Call +590 590 276541 for flight info. If you would rather avoid the short flight, several inter-island high-speed ferry services operate regularly between St Maarten and St Bart’s. It’s a 45 minute ride. As to not being able to afford a yacht charter, Terry, you might be surprised. 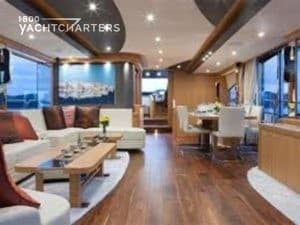 Megayachts are certainly very expensive, but many travelers prefer smaller, more intimate crewed catamaran charters for their yachting vacations. A family or group of 8 passengers can rent a crewed catamaran for under $15,000 per week, inclusive of all meals, alcohol, crew, and LOTS of onboard watersports toys like bananas, wakeboards, snorkel gear, underwater scooters, SCUBA diving, etc.